Some time ago, one of my daughters began having difficulty falling asleep and staying asleep. Our pediatrician recommended putting a fan in her room to create white noise. Around the same time, we moved she and her sister into the same room in order to use the other bedroom as a play room. Between the two adjustments, the problem seemed to be solved. However, it resurfaced a few nights ago. She lay in bed for at least an hour and a half before falling asleep, then came to our bedroom an hour later to say she was awake and couldn’t go back to sleep. After a repeat of that on Sunday night, I began wondering what to do. She and I had already begun praying together about the issue. On Monday afternoon, while I was outside walking in our neighborhood (keeping one of those New Year’s resolutions! ), I prayed and asked God for wisdom for the situation. 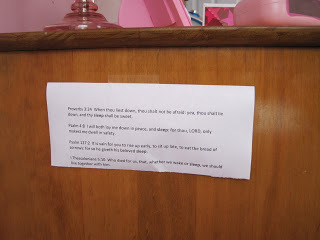 A moment later, the thought that came to mind was to find a few Bible verses that talk about sleep, print them out on a sheet of paper and tape it beside her bed. We could read through them each night before I turned out the lights and, even in the dark, she could know that those verses were there. When I picked her up after school that afternoon, I was excited about sharing my idea with her. Before I could say anything, however, she mentioned to me that in her devotional book that morning she had read that when you pray for something, you should believe and have faith that it will happen. She said she didn’t feel like she had truly believed God would answer her prayer about falling asleep quickly, but now she did and would pray that way. I then shared my thought and, since she thought it was a good one as well, we decided to do it. Here are the Bible verses we chose to use. I’m happy to say that, between the Bible verses and faith in prayer, she had a great night of sleep! I’m hopeful that this will continue and so thankful that we can pray to God about anything, including wisdom to handle every situation, and He will hear us. Having her (and me!) sleeping through the night works for me!! Be sure to visit Works for Me Wednesday hosted by We Are THAT Family. This is a great post! I might have to borrow you idea to help me sleep too 😉 Heres to many nights of restful sleep for all. The Hearer of Prayer always answers! Sleeping through the night has been a struggle for our 3 year old. Wondered if it had something to do with growing pains. What a wonderful "solution" to this problem. Taking everything to God in prayer and reminding ourselves of His promises reap many blessings. My youngest is napping terribly and it is affecting the whole family. I have been petitioning the Lord for His grace in the situation. I am excited to see what His plans are! I just love this. Your girls are incredibly blessed to have a mommy who seeks wisdom from the Lord in everything, even the matters that seem small in the world's eyes. The Word of the Lord is one of our most powerful tools! Great idea to put up the Bible verses. I have 2 that tend to wake up "scared" and I have tried to be very diligent about praying over all the children each night. I didn't last night and . yep… 2 little ones up. Thanks for sharing! You are a woman after my own heart! God's Word can calm any storm – no matter how big or small. wonderful solution :)Looking foward to more inspiring posts from you! ~ Emily N. from "too Blessed 2 Stress"
This is a lovely idea. 🙂 My Katie is only 11 months, but if she ever has trouble with sleep in the coming years, I will definitely keep this in mind. God's Word is so very perfect! What a wonderful idea! It's so touching and beautiful thing to do. Gods words is perfect. 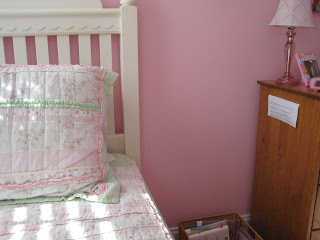 I love this idea for my 7 year old daughter who sometimes has trouble falling asleep. Thanks! Praise God for her sweet sleep! 😀 God is good!